I loved this film, from the moment the tank rolls across a muddy British field to the moment American alien conspiracist and conman alienfromArcturus gets pulled by... but that would be telling. And then I met Martin Gooch, writer, director and player of the lead role, coming out of the cinema (wow!) and he asked me the billion-dollar question: 'So, what did you like about it?' I fumbled with a few adjectives, but really... I'm going to try to do better here. You could watch a pan-dimensional space romp and maybe enjoy it, but it would be as empty as the calories in the popcorn. 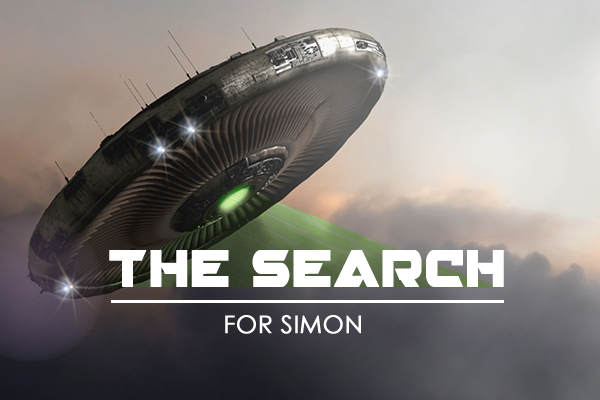 The Search For Simon has all these different superimposed and interacting worlds and what makes them special is the fact that they're here, right now, in conflict with each other and people have to live with them. There's the narrative David invented for his brother and believes in, the one he's suppressed and forgotten, the one Eloise is building around him, the fantasy game worlds which are meant to distract him from the first one, the manufactured world of conmen who exploit the gullible and the other one, in which there may really be something out there. It's really very clever and complicated in a completely watchable way. I'm left at the end with all kinds of ideas about the potentially healing, potentially destructive power of the stories we build around ourselves. When I was watching the film, I completely believed in the story of what happened to Simon, and especially to David. After a while, my skepticism switched on and I started wondering: could that really happen or is it just one of the narratives we tend to accept? I'll have to try to find out at some point, but not here because it would count as a spoiler. The other world that comes into the film is, of course, the setting. Whenever I see a film that hasn't been made in Hollywood these days, it's like stepping out of the holo-deck into fresh air. I think it must be something to do with lighting or the way the shots are set up, but it looks real. I like that. Also, the special effects are in the best tradition of British special-effectology. I sincerely hope no actual cows were injured in the making of this movie. For some subliminal reason, The Search For Simon makes me think of aardvarks. They're one of my favorite animals anyway, and like this film, they're both odd and prosaic, endearing and fascinating, and you can't really tell which bit of them belongs. Since everyone else sticks pictures of cats all over the place, here is a picture of an aardvark. "Porc formiguer" by MontageMan is the author of the original image - Cropped from File:Porcs formiguers (Orycteropus afer).jpg. Licensed under CC BY 2.5 via Wikimedia Commons.